Can You Mix Fresh and Previously Collected Breast Milk? If you pump, or hand express, your breast milk at different times during the day, you may be wondering if you can combine the breast milk from different collections into one storage container. Well, if you follow the proper guidelines, you can. Here's what you need to know. When you're dealing with your child and your breast milk, safety is the top priority. So, there are a few things to think about before you decide if combining breast milk is safe for your child. Here's how to tell if you can combine your breast milk or not. You have a healthy, full-term baby. You are expressing and collecting breast milk for your own private home use. Your hands, pump, and collection containers are clean. You collect all the breast milk that you are combining on the same day. Your child is premature or has a compromised immune system. When you collect breast milk for a sick or premature infant, you should seal and store it immediately. Once sealed, the collection container should not be opened again until it is ready to be used. When you keep the bottle sealed, it helps to prevent contamination of the breast milk or the container. You are bringing your breast milk to the hospital for a sick or premature child, or you are collecting breast milk to donate to a human milk bank. In these situations, you should follow the guidelines for milk collection and storage given to you by the hospital or milk bank staff. You are not in a clean environment, or you are not able to wash your hands before collecting your breast milk. If you believe your breast milk can be contaminated, it's best to pump and dump that session than to compromise your child. You are collecting breast milk on a different day. It is not safe to add breast milk that you pumped today to a container of breast milk that you pumped yesterday or last week. You can add freshly pumped breast milk directly into a bottle of room temperature breast milk as long as the previously collected room temperature breast milk has not expired. Breast milk can stay out at room temperature for about five to eight hours depending on how warm or cold the room is. If you have a few pumping sessions within that time span and wish to combine the milk that you pumped, you can. You can then choose to store the milk or use it for a feeding. 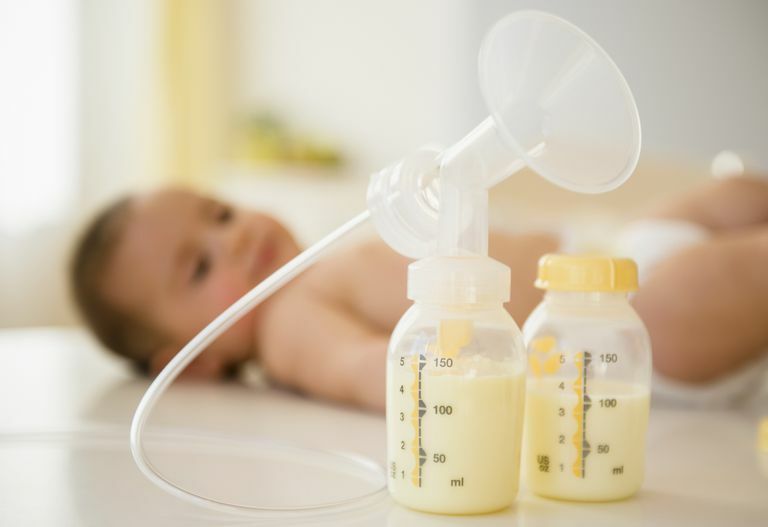 Tip: When you add breast milk from different pumping sessions to a bottle of room temperature breast milk, you should consider all the breast milk in the container to be as old as the oldest pumped milk. So, if you add new breast milk that you just pumped to milk that you pumped three hours ago and left out at room temperature, the entire container, including the fresh breast milk is now three hours old. You can add more breast milk to a container of refrigerated breast milk, but it should not be freshly pumped breast milk that is still warm at body temperature. If you'd like to add your most recently pumped fresh milk to a bottle of already refrigerated milk pumped on the same day, you need to cool it down. Tip: First, place the fresh breast milk into the refrigerator for 30 minutes to an hour. Then, once it is cool, you can add it to the other container of refrigerated milk. If you have defrosted breast milk and fresh breast milk at about the same temperature, you can put them together in the same bottle to feed to your baby. However, freshly expressed breast milk is more beneficial than previously frozen breast milk, so it's better for your baby to get every drop of your fresh breast milk. Tip: It might not be as convenient, but it's better to give the fresh breast milk on its own first. Then, finish the feeding with the defrosted milk. This way, the fresh breast milk will not be wasted. If there's any left over at the end of the feeding, it will be the defrosted breast milk that gets thrown away. You should not add your freshly expressed breast milk to a bottle of defrosted breast milk if you plan to store it. Once you thaw out frozen breast milk, you cannot freeze it again. You must use it within 24 hours or throw it away. Tip: If you'd like to store your fresh breast milk, you should keep it separate from any milk that you have already thawed. You should not add warm, fresh breast milk to already frozen breast milk. Warm milk can cause the frozen milk to thaw out. However, if you cool the fresh milk, you can then add it to the frozen milk as long as you pumped it on the same day. Tip: Place your fresh breast milk in the refrigerator until it is cold. Then, add the cold, refrigerated milk to the bottle of already frozen milk. This process is called layering. Combining the breast milk from different expressions on the same day can be convenient, especially if you're only getting a small amount of breast milk at each session. Filling up one container instead of having a small amount in many containers just makes sense. It certainly makes it easier to store, transport, and ship your breast milk. Plus you won't need as many containers, and you'll save space in your refrigerator or freezer. As long as you follow the guidelines and tips above, you can safely add fresh breast milk to milk you already pumped during the day. Eglash A, Simon L, Academy of Breastfeeding Medicine. ABM Clinical Protocol# 8: Human Milk Storage Information for Home Use for Full-Term Infants, Revised 2017. Breastfeeding Medicine. 2017 Sep 1;12(7):390-5.